Cover of one of the catalogues. PDF. More pages. 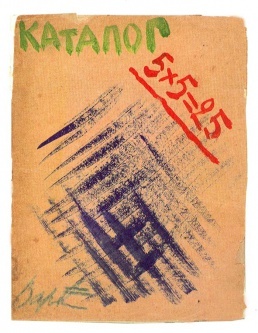 5x5=25 was a two-part abstract art exhibition held in September–October 1921 at the club V.S.P. (All-Russian Union of Poets) [В.С.П. (Всероссийского союза поэтов)] on Tverskaya 18 [Тверская 18] in Moscow. The five artists whose work was shown were Aleksandra Ekster, Lyubov Popova, Alexander Rodchenko, Varvara Stepanova and Alexander Vesnin. They presented highly abstracted, geometric work that rejected expressionist forms of painting common before the World War I and pretended to be the "end" or "death" of art. Each of the five artists produced five author's copies of the exhibition catalogue by hand, in varying sizes and illustrations. Common to the entire run is only the text typed on a typewriter.